Memoirs of an imaginary Friend is a very special book. Deliciously funny, terrifying and heartbreaking in equal measure, I discovered it at the perfect time and took away much more than the simple pleasure of a well-told story. Budo is our narrator. He is Max's imaginary friend, and is unlike most of the other "friends" he's encountered. He's much much older for a start: most "friends" disappear after only a few months, some after only a few minutes. Budo is five years old, because Max has needed him for much longer than most children need an imaginary ally. Max attends school, like all other children his age, but he has different needs to most of his peers. Sometimes he gets "stuck", when he's overwhelmed or frightened; he attends the "Learning Centre" for targeted support, and his mum wants to involve a psychologist in order to understand him better. He is special, but that makes him a target for bullies like the vile Tommy Swinden, and a monster who doesn't look like a monster, who becomes the most menacing threat to Max's wellbeing of all. No wonder Max needs Budo to look out for him. Budo always has Max's best interests at heart, but what if that means Max won't need him anymore..? Whilst I truly wanted to savour this wonderful book, I found myself unable to stand the suspense! It is riveting from the very start, and though I could easily guess what might happen in the end, not one page of the reading towards it was wasted. Masterful storytelling indeed, and highly recommended to those who enjoyed Room and The Curious Incident of the Dog in the Night Time. I give it 5 out of 5 stars without hesitation, and hope that after reading my review you may buy yourself a copy and enjoy it too. 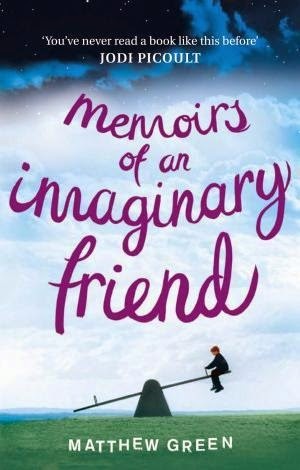 Memoirs of an Imaginary Friend by Matthew Green, Reviewed by: My Literary Notes on 14th April 2015.